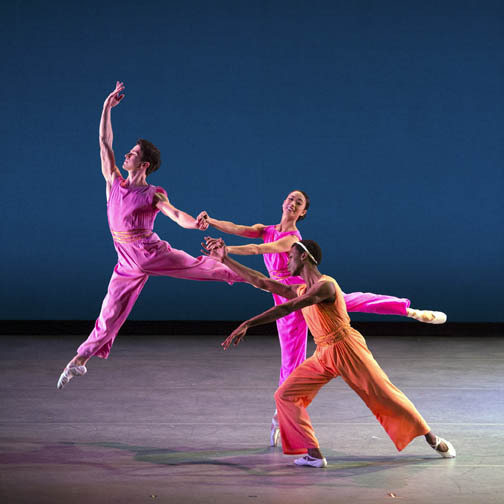 Mark Morris’s After You, a new commission from American Ballet Theatre, is textbook pleasant and thus a convenient opener for a company wishing to present a thirty-minute ensemble work. Performed by 12 dancers and set to a composition by Johann Hummel (Septet in C-major, Op.114 “The Military”), the ballet’s title, After You, refers to what is said when two people nearly collide. One person gives permission for the other to take the lead. Thus the ballet, seen October 27 at the former New York State Theater, evokes an abnormally civilized world of dance—especially for Morris, who has been celebrated for making ballets to classical music that dabble in physicalized human faux pas. Nothing of this sort is seen in the three sections—titled Allegro con brio, Adagio and and Menuetto. In Isaac Mizrahi’s unisex style silk pajamas in fuchsia and tangerine orange, the ensemble carries out ballet steps in suspiciously peaceful harmony with each other. Hummel’s music, under the baton of David LaMarche, supported this mood in its grinningly bright orchestration. Arron Scott, Stella Abrera and Calvin Royal III in After You. Photo: Rosalie O’Connor. Despite the polished performances of principals Stella Abrera and Gillian Murphy (as well as that of winningly confident corps dancer Calvin Royal III), the ballet as a whole made me think that Morris was making fun of ballet. And he said as much at N.Y.U.’s Center for Ballet and the Arts, the day of the work’s premiere (October 20). “I’ll do anything for money,” Morris joyfully admitted in reference to his commission by ABT to a standing room audience event, which was held to launch Dr. Stephanie Jordan’s Mark Morris: Musician – Choreographer (Dance Books). At N.Y.U., Morris added that while his dancers can do anything, ballet dancers are limited (they have trouble walking like normal people and they dramatically emote, which he despises). Of course, this is not the first time that Morris has made fun of ballet dancers. But I nonetheless had to wonder why ballet companies continue to commission him to choreograph, when in return he flips them the bird. The only answer I have is that Morris delivers the kind of conservative fair that colludes with the current conservative ethos of American Ballet Theatre. Jennifer Homans, who directs N.Y.U.’s Center for Ballet, calls today’s ballet companies “big business.” Perhaps ABT needs to commission works that are risk adverse. Also in the program was ABT’s premiere of Frederick Ashton’s ground-breaking Monotones I and II, created for The Royal Ballet in 1965 and 1966, respectively. Ashton’s ballet is inhabited by three dancers (in each section), who perform only slow, unfolding movement. The work becomes daring for its hushed quality (no “ta da” moments, no multiple pirouettes). Ashton once explained that his ballet was inspired by space travel. Set to Satie’s titular score (originally orchestrated by Debussy), the music of Monotones suggests time lapses through the pregnant pauses that float throughout the score. With matching caps, the dancers appear in sleek unitards (lime color and then white). Originally designed by Ashton, these costumes help render the dancers into heavenly bodies. Their supported adagio work brings to mind the movement of comets drawing the night sky in parabolic splendor. In the second section, Veronika Part dances most of the ballet on pointe, thereby transforming into a white rocket pointing to the sky. Her two partners (Thomas Forster and Cory Stearns) look as though they are preparing her for lift off by burnishing her limbs with theirs. These are not men and women, Ashton suggests, but forces; their technical elegance ensures seamless orbit in zero gravity. The last ballet on the program, Kurt Jooss’s Green Table (1932) can also be said to be radical because it is about war. Despite the United States’ continual of fighting wars since 2001, it seems odd that no ballet companies have chosen to tackle this looming subject. Of course, it’s a risky subject. War does not beget happy endings. This fact is clearly presented in Jooss’s ballet, whose subtitle is a Dance of Death in Eight Scenes. Dancing the character Death, the virile Marcelo Gomes shows that no scythe is needed to kill. The musculature of his legs and arms, further emphasized by a gladiatorial costume that emphasizes the bulk of his quadriceps and pectoral muscles, is weapon enough. The work is not so much a kinesthetic dance experience as a set of stark tableaux. It’s eye-widening to see how much war’s violence can be communicated with so little movement. This entry was posted on Monday, November 9th, 2015 at 2:10 pm	and is filed under The Torn Tutu. You can follow any responses to this entry through the RSS 2.0 feed. Both comments and pings are currently closed.